Kenny Nelson started swing dancing in 1997 when the swing revival hit. Riding this wave, he discovered lindy hop and other related vintage swing dances. His curiosity, desire to learn and perform has kept him hooked ever since. His classes are known for being fun, detailed, and technique based whether he’s teaching Lindy Hop, Balboa, air-steps, West Coast Swing or Blues. Kenny’s competitive side has found him winning at numerous events including Camp Hollywood, Lindy on the Rocks, Ultimate Lindy Hop Championships, Camp Jitterbug and others. When he’s not dancing, you can typically find him doing Parkour and Crossfit, pursuing great local restaurants and drinks, or brainstorming crazy new moves. 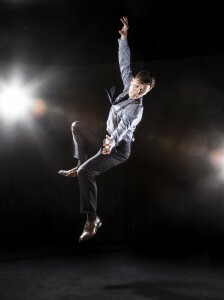 Jesse Hanus began dancing in 2003, starting with ballroom and then moving smoothly into Lindy Hop and Charleston. Her love of expressing herself to Jazz and Blues music keeps her interested ever since. Attending dance events around the US and Canada to teach, compete, perform and DJ, she is passionate about spreading her love of dance to anyone willing to learn. Jesse holds titles from events like Lindy Focus, Midwest Lindy Fest, Rocky Mountain Girl Jam and Followlogie in both solo and partnered divisions. She is a recent Denver transplant from upstate NY, is on the organizing team for Stompology Authentic Solo Jazz Dance Weekend and is one of the original founders of Rochester’s all-girls dance troupe, the Flower City Follies.